* The pattern of less healthy lives: such as smoking, fatty foods, lack of fiber, etc..
Before you understand more about the symptoms of brain cancer, you need to understand the human brain structure first. The brain is an important organ that regulates all the activities / movements of the human body. Just imagine you're on a motorcycle, how many activities you do? Seeing the road, drive, look left-right, see the rearview mirror, balance, not to mention while thinking what to eat tonight ... Within one second, there is riburan things happen in your brain (both of which occur consciously or unconsciously). The brain can be multitasking like this because all the activity regulated by different brain parts (each part has a different function.) In general, the human brain is divided into three parts, namely a large brain (cerebrum), cerebellum (cerebellum) and brain stem (brain stem). Each section is subdivided into smaller parts, where each small part is divided again, and so on. Fills the space between the brain fluid (cerebrospinal fluid), while the exterior is protected by three layers of the lining of the brain (meninges) and bone of the skull. Well, every part of the brain can be affected by tumor / cancer. Although benign tumors, but because of the growth in the brain, can be very dangerous. 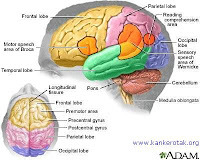 The tumor may interfere with and damage the structure of the central nervous system, because it is located in the cavity is limited (cranial cavity). Along with the development of these tumors, brain tissue will be more depressed. Whereas the volume of the cranial cavity is very limited and unlikely to grow big. This is what makes the headaches / dizziness as an initial symptom of brain cancer. Remember, the list above is only a symptom. Even if you experience one or more of the above symptoms, you may not be affected by brain cancer. To make sure, you should be examined immediately by a doctor neurologist and undergo further investigation such as CT scans, MRI, angiogram, myelogram, spinal tap and biopsy.